(Camden, NJ) – Last year, the Freeholder Board took a thoughtful and researched approach to discouraging panhandlers and addressing challenges with the chronically homeless by adopting a progressive policy that offers a day’s wage and social services for anyone willing to work. This program has made an indelible impact within the homeless population in Camden County and provides the dignity and respect of a job. Over the course of the year, 396 individuals earned a day’s pay and 127 of those participants accepted social services to improve themselves and their outlook. Any individuals looking to perform a day’s labor are allowed in the program with no mandates or prerequisites, opening the door to anyone looking for an honest day’s wage. Individuals who have been successful moved on to phase two of the program called Bridge to Work. Bridge to Work, created about six months ago as a second phase to Work Now, provides permanent part-time employment through Camden County College. Graduating to the next level puts participants on firmer ground to find permanent housing and move on to a private employer. Putting the persistently homeless to work in part time jobs and transitioning them into fulltime employment will save the county and taxpayers hundreds of thousands of dollars and provide relief from a suffocating stress on a variety of institutions. The chronically homeless are categorized as “super-utilizers” when it comes to healthcare and first responder services. Regarding incarceration, it costs Camden County $55,000 a year to house an inmate in the jail. According to the U.S. Department of Housing and Urban Development, Camden County experiences around 500 to 600 homeless individuals on any given day. The objective for this project is to make a multi-pronged effort to address this population with a variety of resources from employment to services from the Office of Mental Health and Addiction. In addition, working alongside our partners, Volunteers of America, and a variety of other organizations, we will be able to provide more professional assistance. Furthermore, we have leveraged multiple agencies, nonprofits and advocates to work in tandem to achieve our goals of ending homelessness. The cost of the labor programs for 2018 was $90,000 and includes the social services work by outreach personnel in the field and the wrap around services that clients are offered. A day’s pay in the Work Now program is $75 a day and the Bridge to Work program offers full part time employment with Camden County College. Based off the success of Camden County’s Work Now program Philadelphia will be launching its own day-work program on April 1. Another partner, and long-time institution in Camden County, is Cathedral Kitchen. New Executive Director, Carrie Kitchen-Santiago, talked about the objectives of her organization and its commitment to assist the county in its work. Founded in 1896, Volunteers of America Delaware Valley (VOADV) is a local affiliate of a national non-profit organization that provides essential, wrap around social services – from casework management, legal assistance, employment and housing placement to crisis/treatment interventions, counseling, mental health and substance abuse treatment – to the most vulnerable individuals in each of the communities we serve. 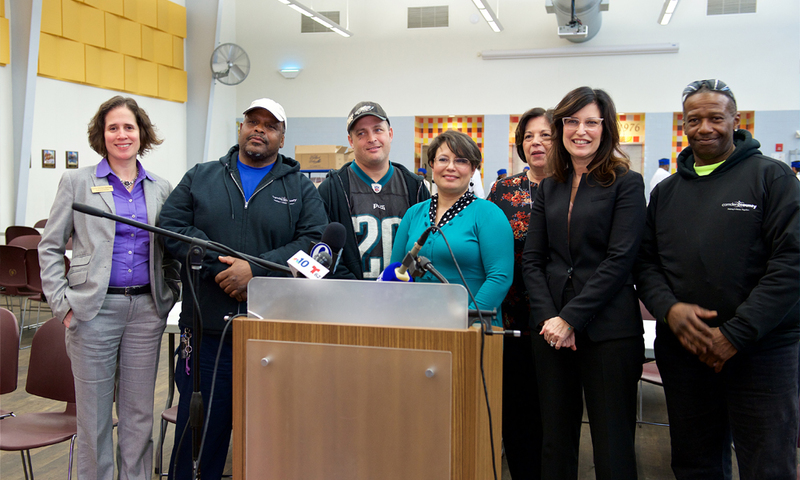 VOADV provides services to more than 12,000 individuals annually throughout the southern New Jersey and greater Philadelphia region and has remained the leading provider of homeless, reentry, emergency and affordable housing services in the southern New Jersey region. Since 1976, the Cathedral Kitchen has grown from a simple ministry offering soup and sandwiches to a few people in need to the largest food provider in Camden. The organization provides over 8,000 meals each month in their dining room and to other agencies and programs throughout the region. A professional kitchen staff prepares meals, using both donated and purchased food. The opening of a new facility in 2008 and the rehab of the adjacent building in 2015 allowed Cathedral Kitchen to expand our services to include job training, healthcare, food support outreach and social enterprises that help back social service programs.